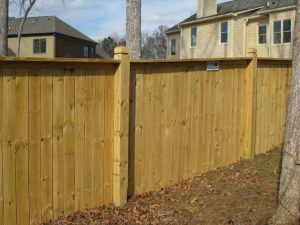 We utilize only the highest quality materials in our fencing projects. There is nothing like the warmth and beauty of a natural wood fence. Wood fencing materials we offer include: Pressure Treated Pine, Yellow Pine and Western Red Cedar. For best results we highly recommend that you paint, stain or apply water proofing to your new fence. If treated properly, your new fence will deliver years and years of quality service.